A beautiful cake that is great served warm fresh out of the oven or when cooled. This recipe is also gluten free! Tip: this cake is very moist so keeps well for 2–3 days, covered. Preheat oven to fan 165°C. Slice strawberries and place in a small saucepan with tangelo juice and zest. Bring to the boil, simmer for 2 – 3 minutes then remove from the heat. Using a stick blender, puree the strawberry mix. Whisk the sugar and eggs in a mixer until pale and creamy (6 -8 minutes), then fold in the almond meal and cooled strawberry mix. Pour into a lined 22cm loose bottomed cake pan, and bake for 1 hour or until golden and set. Allow to cool slightly in the pan. Run a knife around to loosen the edges, then invert onto a serving plate. Combine remaining juice and caster sugar in a small saucepan, cook until sugar dissolves and syrup thickens. Add zest and remaining sliced strawberries, cook 2 minutes and cool slightly. 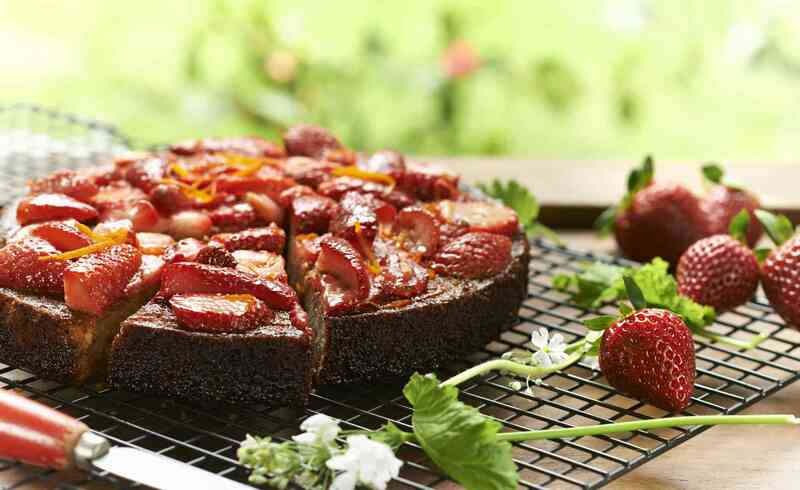 Arrange cooked strawberries on the top of the cake, then drizzle over syrup. Serve cake warm with ice cream.